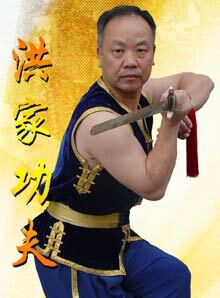 For our money Grandmaster Wing Lam was the best Hung Gar teacher in the Bay Area. He has retired. A great pity. materials (see the list for staffs above - plus copper, brass ...) for the shaft. Both the pu dao and the trident cost about $110. a personal weapon and uses a borrowed weapon at class. You would bring your personal weapon to exhibitions. in formal Hung Gar clothing with a straight sword. It is popular to wear studded leather wrist wraps. Besides photos, the Weapons page has links about transporting, bags, covers, flags and tassles.